This review will be quick as I’m just filling in for Vault here at the last minute. Luckily, this is a figure that there’s really not too much to say about: Captain Marvel, Jr.
First of all, Captain Marvel, Jr. is packaged & sold as Freddy Freeman because a certain comic company made much more famous use of the word Marvel twenty years after Freddy was created. Doh. It’s a great irony though as Captain Marvel, Jr. can’t even say his own name anyway. As any lay-comic fan could likely deduce, Freddy is Captain Marvel’s sidekick, but unlike Mary Marvel who received her powers from Shazam, Freddy was granted his powers from Captain Marvel directly., That means his magic words are: Captain Marvel. Kinda hard to get a brand going when you can’t say your own name! Back in the day, when it snowed uphill to school both ways and DC Comics published stories I wanted to read, the Marvel Family was one of my favorite corners to explore. They have a rich pre-DC back story from the Fawcett Comics days. The 90s also saw an amazing Power of Shazam run. Sadly, recent years saw the family falling on hard times via poor writing, Mary Marvel in particular. I drifted away from them and haven’t really looked back. I haven’t bothered to follow along with the nu52 Shazam at all. Despite our falling out, I did still need to have the primary members of the Marvel Family in my DC Classics collection. And I’m not alone. Captain Marvel, Jr. is a pretty big character to cross off the list this month and I’d be surprised if Mattel didn’t purposely schedule him to arrive right during subscription sign-ups. It’s what I would do. There is just one tiny problem though. And it’s something Mattel can’t really fix. While Captain Marvel, Jr. is likely to be one of the more demanded characters to be put in the subscription this year, he’s still just Freddy Freeman. He hasn’t had his own title since DC sued Fawcett sixty years ago. In his years at DC, he’s done a few cool things, been a Titan & an Outsider, got an even dumber name for a bit (CM3 – and this was before hashtags), but he’s not really had a chance to stand out. And in that regard he kinda amounts to much needed shelf filler. Man, when I write reviews in the morning, I’m all somber. Ive been moping bout that shrunken head for weeks, I’m a little surprised that you barely even mention it! I think the line has tended towards oversized heads a bit, so I wasn’t sure at first if this figure’s noggin’ looking undersized because of that or because the head really is a smidge smaller than it should be. I took him and put him a good 4-5ft away and I didn’t find the size too distracting. I think this figure turned out pretty well, from your (excellent as usual) review pics. Certainly much better than poor, poor Mary. And I’m extremely happy they made the “core” Marvel Family in their vintage uniforms before fully descending into reboots and redesigns. The golden age Captain Marvel Jr. strip was often drawn by forgotten genius Mac Raboy, who turned out amazing-looking art. 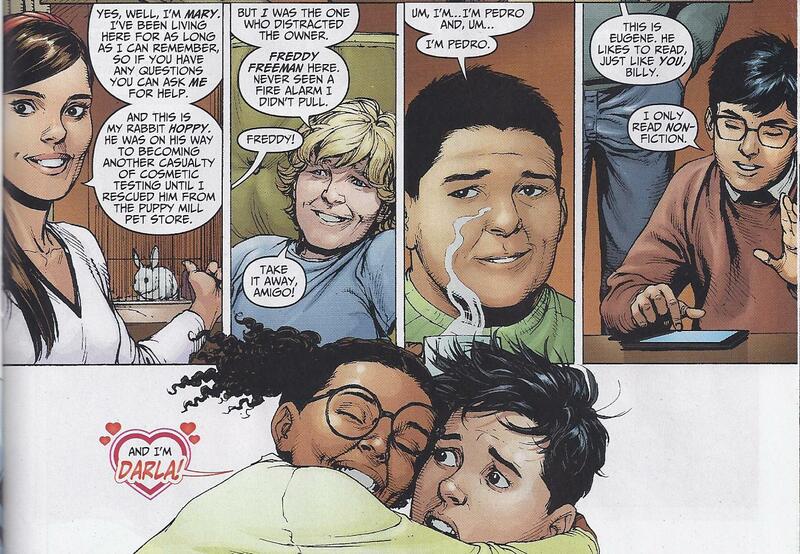 Raboy gave Junior a distinctive curled hairdo. A young man named Elvis Presley read many of these Captain Marvel Jr. comics, and liked Junior’s hairdo so much he chose to emulate it when he became a singing sensation. Raboy did fantastic work. I think Junior might have had the best of the Marvel books back in the day. It wasn’t just Elvis’ hair he copied, as he also tried to emulate Junior’s style of dress, albeit with open-to-the-navel fashions. This was later reflected in Kingdom Come where Freddie and Mary are now the Elvis-esque King Marvel and Lady Marvel, where she bore a passing resemblance to Priscilla. Good use of the teen buck, though! Finally? Also back to DC Direct for a minute, they released Hoppy in with Billy, figuring he’d be the peg warmer. We got a (too-small, but appreciated nonetheless) Tin with Platinum… maybe an add-in statue of a character beats accessories? They did do a great set. I remember some irritation – it might’ve been not getting the white version of Mary Marvel (I prefer that over red, good upgrade). DCD had a lot of great sculpts, but the lack of articulation always annoyed me. I did start reading Trials and I was loving it. Freddy stepping up to be Captain Marvel is exactly the type of story I want from DC! I don’t remember how it ended though, I think there were some delays or some such towards the end? I do remember really liking it though. And, yeah, Cry for Justice. Ugh. Starman is one of my all-time favorite books, but I gave up on Robinson after that. Awful book all round. CM3 looks like a young Jerry O’Connell to me. I guess I’m not the only one who sees Jerry O’Connell there. Oops. I can totally see it! I was thinking maybe young Nathan Fillion earlier, but then I realized it just looks like my friend, Mike! But I see O’Connell in there now too! he’s the fat kid from stand by me!! yep. I just saw Scary Movie V last week with him in a bit role, but this looks more like the younger post-My Secret Identity, pre-Sliders Jerry as a brunette. I hadn’t noticed that his head was small. Looking at him side-by-side some of the other teen figures, I guess it is a little smaller, but I think it looks fine. I also don’t really know what Freddy’s face should look like, but I liked the expression. It’s like he’s determined, but still in a pretty good mood. And I’m not sure if this is who you are thinking of Noisy, but elsewhere I’ve seen the comparison made to Jerry O’Connell. There’s definitely a similarity there. Freddy was a figure that I wanted, but didn’t have a lot of attachment to the character, but I think he’s become my favorite of the marvels. Some combination of his colors, the head sculpt, and his flared color just make him stand out from the other too. I was kind of surprised by this because I wasn’t expecting much from him, but he definitely was cooler once I had him in hand. He’s one of the best out of the three that’s for sure. I was never too keen on Cap’s head sculpt and Mary’s one of the worser figures in the line overall. And, yes, his head is small in comparison, but it just doesn’t seem too bad on the body. I’m right there with you re: new52, but I would recommend picking up the Shazam TPB this fall collecting the backups from JLA. Great Gary Frank art and a fairly good ‘Ultimate’ take on the property. It almost is enough to forgive the criminally awful hood they gave him. I saw it in the back of JLA when it started and it just wasn’t what I wanted. Did it end stronger than it started? Y’know, the sad thing is – I enjoy the DC aesthetic so much that I look at that nu52 Shazam and I think it makes a sharp looking action figure (sans hood). Enough so that I kinda want it, adding it to my collection as some time-lost Shazam from a brief, bygone era. I shouldn’t waste the money though. I think the head is a little undersized. Especially comparing it to Billy or Mary. I also need it to match up with Superboy because Superboy Plus the Power of Shazam #1 was an early foray into comics for me. I think he looks like Jason Bateman or that other actor that looks like Jason Bateman. I’ve always loved the Marvels – or Shazams, or whatever – ever since the old Shazam/ Hero High cartoons waaay back in the day. Anyone else remember those? Anyway, I think this figure turned out great, but I agree that for the price, Matty should have included a Hoppy or Tawny doll accessory or something. But what else should we expect from those guys? I will say one more thing though: the artwork on the packaging was absolutely abyssmal. I mean, just distractingly bad. Otherwise, a solid sub offering. Yeah Jerry OConnell! that’s him! Im certainly glad to have another completed team in DCUC and the Marvels are fun. I dont know, the paint job on my Freddy’s head seems to be a little tighter but Im at work atm and unable to compare. He’s definitely not a character I would be super excited was coming but Im glad I have him. The figure itself is great, no qualms there. Time to bring on Talky Tawny! With a jet pack!! CM3 did have a good run as CM1. All I knew was the wizard popped up in JSA stripped Billy and Mary and then turned Black.Adam & Isis into statues. I am to have Freddy in my collection. He was a missing part to the core team. He also has, IMO, one of the best capes Mattel has done in a while. I also liked how you rotated the two different Mary’s in and out of the scenes. 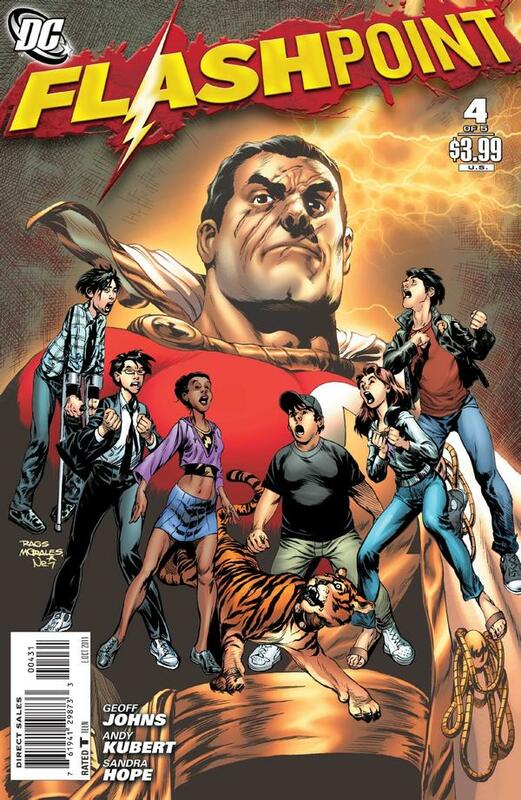 The Power of Shazam (95-99)…is this the comic run you were talking about? I’ve always wanted to read some good Captain Marvel stories but never really pursued anything. Freddie was a figure I had no particular interest getting, but a figure that I’ve come to enjoy posing. His face is unique and amusing. Waiting for Tawny the Tiger! C’mon, DCUC, give us an articulated tiger! * Wait, that would just be a repaint of He-Man’s Battle Cat, wouldn’t it? I honestly didn’t think Freddie would get made at this point. I started to custom him with the s4 Cap and Superman head (closest match I had), but never got past the first coat of blue. oh well. I honestly expected Matty to do much the same after the Trials series with Freddie as a full adult, finally. The fact they tooled new parts for the leaner/smaller buck is good news, imo. Definitely going to try and track him down. This one looks decent, and definitely better than the Marys. Billy looks like a cross between Ordway and Ross takes, while Mary is more Golden age-y. Not sure about Adam, as I didn’t see too much of him between Crisis and JSA. I do agree Freddie looks like a young Jerry and you can really see it in the first body shot. the torso shot is angled, so it doesn’t pop out at you, and that’s probably what is throwing you off at first. Yeah, you can flesh out the Marvel Family with DCD, but I’ve seen the nu52 version and I kinda almost want them. No Uncle Dudley (yet? ), but the mixed trio added to the originals (and blond Freddie!) is one of the few positive steps I’ve seen in the nu52. I saw that…”movie” and …ugh. just UGH. NO. nononononoNO! oh, and Eugene is apparently wearing GREY, not black like Adam. 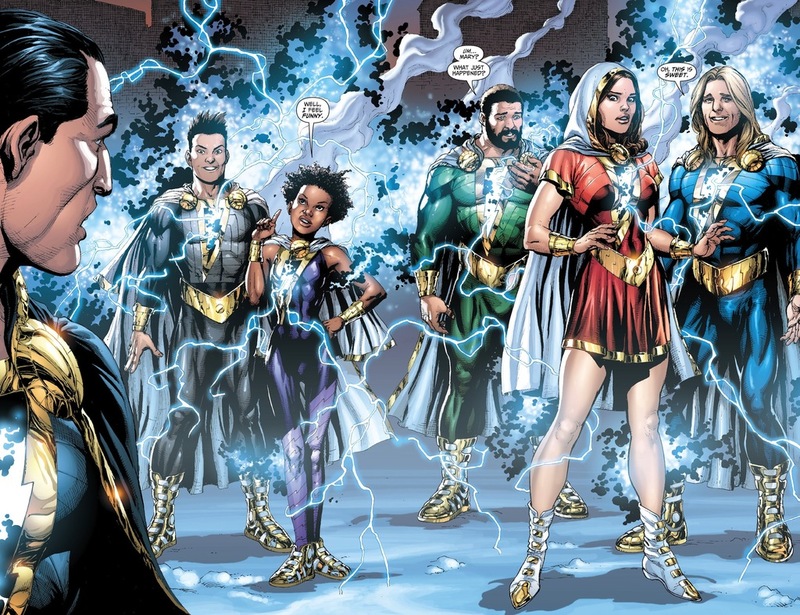 and I think Newsarama had a recent article this past week about the upcoming Black Adam series and they are re-introducing Isis and Osiris, or at least their secret identities. She’s apparently got the ecological bent, and he’s a nerd? Not sure how that’s going to shake out, given what happened to Adam recently that set off Trinity War? It’s not just that Jr’s got a head that’s a touch small, it’s that he’s got a head that’s a touch small on a teenager. One of the simpler tricks of portraying young people in art is to make the head slightly larger in comparison to the body than you would with an adult, and they went the opposite route with Freddy. Unlike Billy and Mary, Freddy doesn’t age to adulthood when he transforms (due to his power being second-hand, basically). I’m getting a weird Jerry O’Connell vibe from that head sculpt, circa his Sliders era maybe. Can Wil Wheaton be far behind? I gotta admit that I haven’t read many Freddy stories aside from the odd World’s Finest back-up featuring the Shazam Family. Freddy is an odd duck: He’s been blessed at times by great artists such as Mac Raboy and Don Newton, but his heyday ended around the time that a young Elvis was just starting out. Still, Captain Marvel Jr. might be the last Golden Age character the sub will be offering fans for awhile, seeing how the focus is leaning more towards 90’s characters or pre-New 52 stuff which Geoff Johns had a hand in creating. So Freddy will be going in storage with Billy and Mary until I have room to display them. In fact, I don’t think I’ll be cracking him open for some time given the number of items I’ve kept boxed up over the last year. The poor guy can’t catch a break.